My two year old LOVES strawberries! She never gets enough of them! We constantly hear “I want mur strawberries pleez”. I think she had about 10 at breakfast this morning. I’m not complaining, I would much rather her love fruit than all the other junk food that is out there for kids. There are times, however, when eating a delicious, juicy, red strawberry is just not convenient. 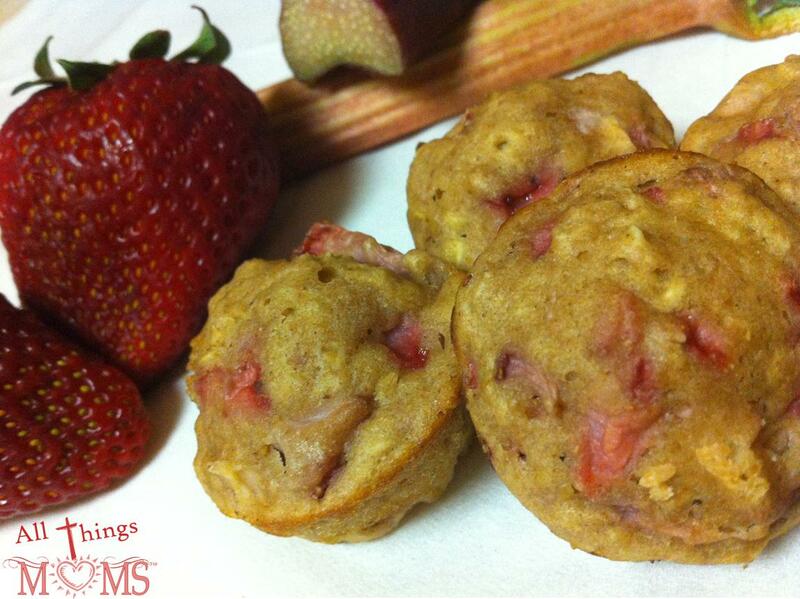 For those times I like to give her these Strawberry Rhubarb Muffins. They are the perfect size to hold on to and make a great breakfast or snack! The best part is she won’t get strawberry juice all down the front of her clothes! 1. Preheat oven to 400 degrees and lightly grease 24 ct mini-muffin pan. 3. In a large mixing bowl combine dry ingredients- remaining flour (1 /3/4 cups), brown sugar, oats, baking powder, salt, cinnamon and ginger. 4. 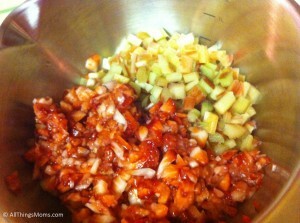 Fold the wet ingredients into the dry ingredients. 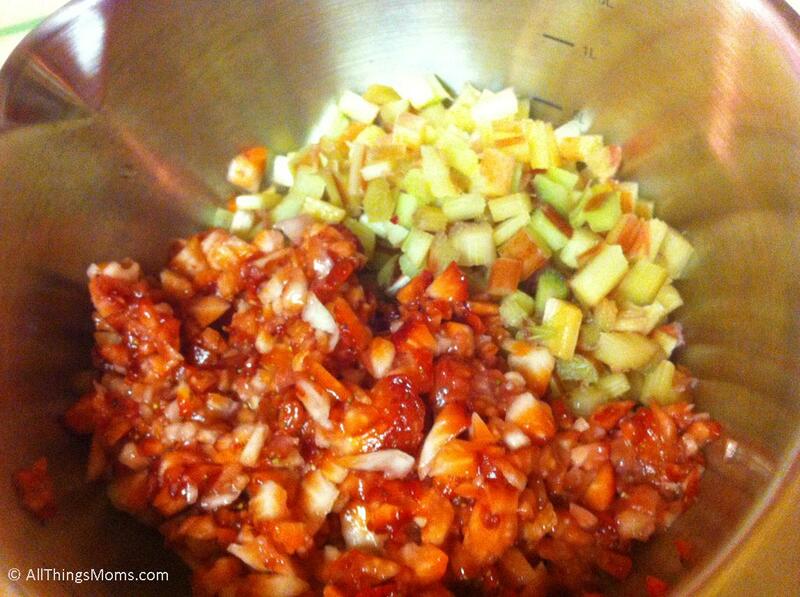 Once combined add the strawberry/rhubarb mixture and mix until combined. 5. 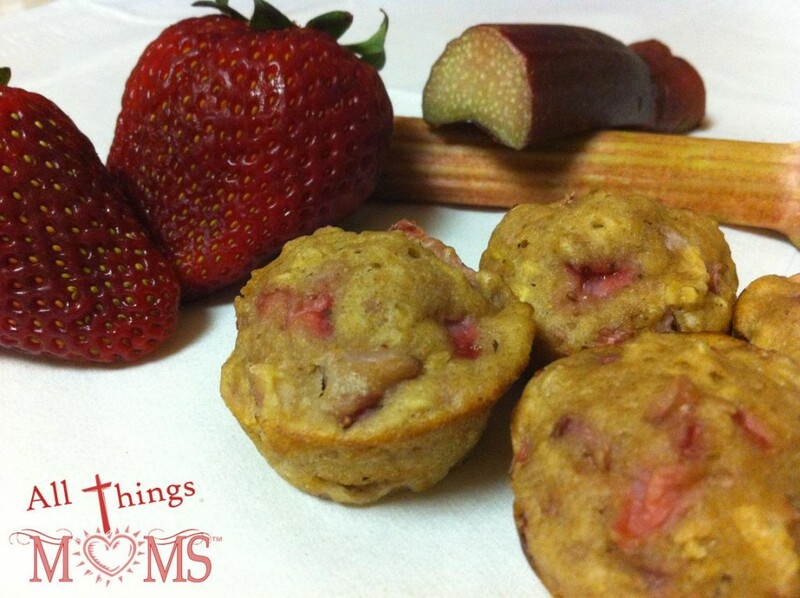 Scoop into mini-muffin pan and bake 15-18 minutes until toothpick comes out clean. Makes 24 Mini Muffins- Enjoy! This recipe makes 12 regular muffins and is perfect for the brownie pan too! We almost always double the batch and put them in the freezer. Just pop them in the microwave to thaw or pack them to go. The mini muffins will thaw out in about an hour and be ready for a quick snack! Rhubarb is also a good source of Potassium, Vitamin C, Calcium and Fiber, combined with the nutrition benefits of whole wheat flour and strawberries you’ve got yourself a quick, healthy snack!